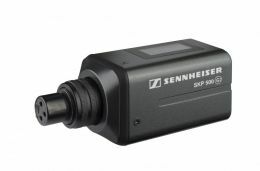 The SKP500G2 plug-on transmitter adapts to any standard low impedance “wired” microphone and transmits the microphone’s signal to a Sennheiser G2 series receiver. The SKP500 features an XLR-female input and adapts to any standard microphone featuring an XLR output. +48 Volt phantom power is supplied, enabling the use of both dynamic and condenser microphones.